This classice 70's style Lake House, set on the edge of Lake Okareka is somewhere to escape for a few quiet days of tranquility. Sit on the deck and just watch the ducks and pukeko's. Maybe take a quiet paddle in the kayaks across the lake to the beach or troll a lure to catch a trout. You will need your own tackle and a licence of course! Fishing in this lake is reknown for being very productive! Or maybe you could take a walk along one of Rotorua's award winning walkways around the edge of the lake and farm perimeter. Lucy Playne one of the farm owners runs a top class horse trekking business on the adjacent farm and if thats you and you want to look across the region the views from up top on the farm are nothing less than sensational. Call Lucy on 07 3628185 or for the website look up Horse Trekking Lake Okareka. The very popular sport of biking today in and around Rotorua offers up to 100 kilometres of trails through forestry tracks, the trail heading to Taupo or simply around the lakes. It really is a bikers paradise! The world mountain bike champs known as Crankworx are being staged in Rotorua in March. Lake Okareka is one of sixteen lakes in the Rotorua District. 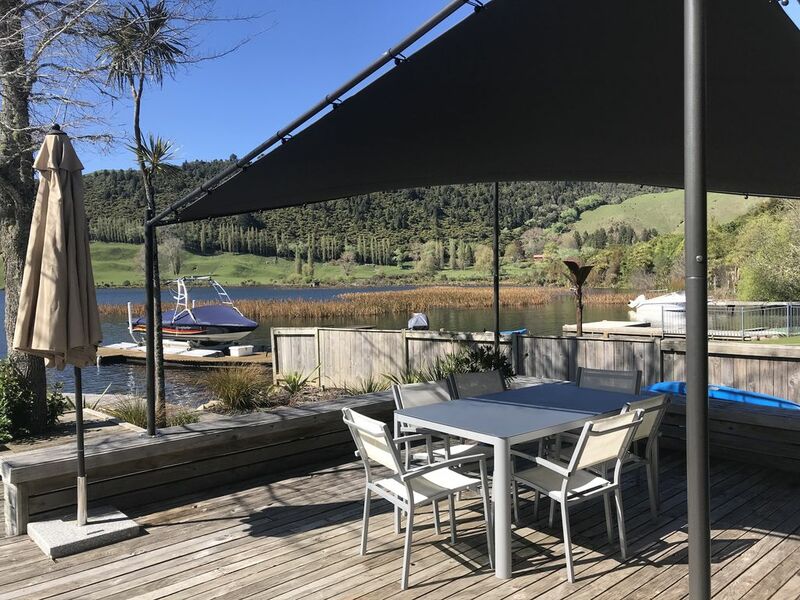 It is only 11ks to Rotorua central which has abundant restaurants, cafes and shopping but tucked away from the main busy tourist routes, you can enjoy a quiet peaceful environment. Only minutes from the Blue Lake. We have 3 excellent golf courses to choose from and if its hiking the Tarawera Trail alongside Lake Tarawera can take up to 4.5 hours to walk to Hot Water Beach, or 3 to the Champagne Pool at the Wairua Stream before you come to Hot Water beach, and you can arrange to be collected by the Water Taxi on phone 07 3628080. This house is situated on the lake edge and children are welcome but one has to watch small children close to the lake edge. Okareka Lake Edge Comfort is fully equipped, just bring your own food. Although a cleaning fee is charged, guests are expected to leave the house in good tidy condition (this fees covers basic clean and laundry not a major overhaul), linen stripped off beds and house basically tidy. No caravans/tents or camping. No Pets. Minimum 2 nights stay. Pricing is for 6 x guests, an extra $25 per person will be charged for extra adults and $20.00 for kids. THERE IS A BOND OF $250 AND THIS WILL BE REFUNDED IF THE PLACE IS LEFT AS YOU FOUND IT. Perfect location for peace and quiet. Wonderful location. The Lake is the star of the show! We had 4 nights here with family and loved the spacious, clean house. The house is well supplied and very comfortable. Only comments other than that, is the timber on the decked walkway needs a little attention and one of the picnic tables has a dodgy seat but all that said, we would go back in a heartbeat! Just love this place and it is easily the best placed home on the Lake. The property was so nicely equipped with everything you can possibly need. It’s spaciousness and clean. So comfortable for our group of 11 adults. The lake in the back yard was the perfect touch. We would stay longer if we didn’t have already have other plans. I definitely recommend to anyone who wants a nice clean comfortable place to relax and enjoy their vacation. It’s not too far from town, shopping or attractions. The owners of this property constantly monitor the place to be sure that their guests have the best possible time at this magic Lake Okareka venue!! We loved our stay at this beautiful property! The house was big enough to accomodate us all and we really loved the use of the kayaks and the table tennis table. The large outside area was well used throughout our stay. The spacious kitchen was a bonus as was the second fridge. We had a great time there. The house is nice, clean, spacious, has wifi and right next to the lake. Instruction is clear and the host is very responsive to all my query and concern. Enjoyed the kayaking and the pool table and the table tennis. Definitely coming back if my family coming from overseas again. Just a recommendation that if possible, upgrade the pool table and table tennis as we enjoyed them alot.